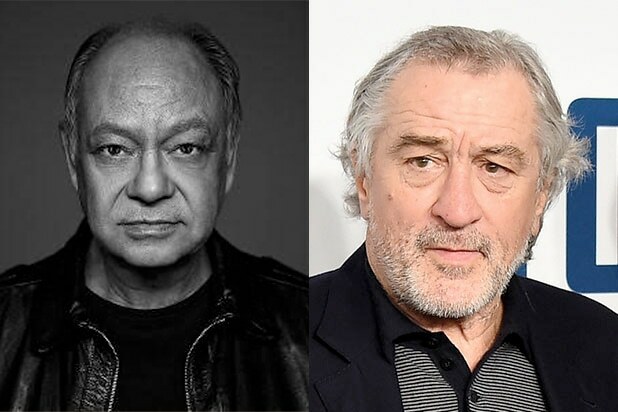 The Robert De Niro comedy “War With Grandpa” has added Cheech Marin to the cast, TheWrap has learned exclusively. Tim Hill is set to direct the adaptation of Robert Kimmel Smith’s 1984 novel, which follows a young boy who loves his grandpa Ed (De Niro). But when his grandfather’s wife dies, he has to move in with his grandson and takes his room — much to the youngster’s dismay, who plots a series of pranks to drive him out. “War With Grandpa” is a TWC-Dimension release. Marin will play the role of Danny, Ed’s friend who still thinks he’s a catch with the ladies. Christopher Walken, Uma Thurman and Rob Riggle are also part of the cast. Marin is best known for being one half of comedy duo Cheech and Chong along with Tommy Chong. The duo released comedy albums, six of which went gold and four of which were nominated for Grammys, and starred in eight films together. The duo reunited in 2009 for the “Light Up America” national tour. He is represented by Innovative Artists. Hollywood stars don't shy away from being 420-friendly. Here are the biggest names in entertainment who like to roll up a blunt or hit a bong -- no matter what the date is. The O.G. of celebrity stoners was arrested on marijuana charges in 1948 and spent two months behind bars. The Red-Headed Stranger is notoriously no stranger to the green and announced that he was launching his own strain of premium weed back in 2015. We have no idea what took him that long. The "Roseanne" star, who smokes to alleviate her glaucoma, got into the weed biz in 2016 by investing in the dispensary Roseanne's Joint. She even famously got stoned an old episode of her show. The former "Gossip Girl" star gave people plenty to wag their tongues about when he was arrested for marijuana possession in 2010. Might as well call him Weed-y Harrelson. Harrelson said he had given up smoking back in 2017, but he might've just traded in his bong for edibles. When she's not appearing in awesome projects like "Fargo" and "Three Billboards Outside Ebbing, Missouri," McDormand serves as a High Times cover girl. The "Pineapple Express" actor not only knows his way around a bong, he's named names when it comes to his famous smoke-out pals. We'd have to be completely high to leave him off of this list. It's like she's trying to kill Hannah Montana by suffocating her in a thick cloud of pot smoke. "Got that sunshine in my pocket." Timberlake says he smokes out because "sometimes I have a brain that needs to be turned off." The main ma'am of "The View" also recently got into the medical-marijuana game. Weed and naked bongo playing? Alright, alright, alright. Silverman doesn't leave home without it -- especially when she's hitting the red carpet. Mary Ann from "Gilligan's Island" got popped for pot in 2008. The comedian shocked the world when he announced that he had stopped smoking weed -- but only with black people. "I mean, I enjoy it once in a while. There's nothing wrong with that. Everything in moderation," Aniston has said of marijuana. Bill Maher was a pothead long before his "Real Time" days, but in 2016 he made a case for medicinal marijuana by actually lighting up on live TV.